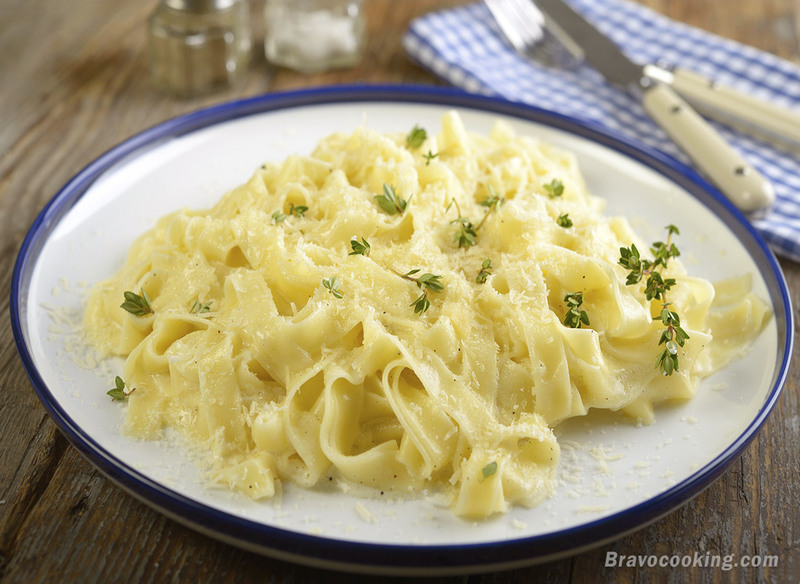 The traditional ingredients for the basic italian recipe of Fettuccine Alfredo, are simple: Fettuccine pasta, butter, cream and Parmesan. Seasoning with salt and pepper will do it for the basic version. Yet, there are many variations around – and it might be worth having a look at them. Put the water into a large pot, add the salt and bring it to boil. Now add the Fettuccine and let them boil for some 10-12 minutes (read the instructions on your pasta package if you are unsure). Stir them every now and then. Taste for al-dente noodles. The pasta is ready if al dente, that is usually about 1 minute before the minimum cooking time indicated on the package. Test if you like it, if not let it boil another minute. Drain well. Meanwhile, melt the butter in a skillet at medium heat, add 1 cup of the cream and mix well. After the butter is melted, remove it from the heat, add garlic, salt and pepper and one cup of Parmesan cheese. Stir well until the composition is blended (slightly thickened). Reduce heat to low, add well drained Fettuccine pasta to your Alfredo Sauce and mix gently. Add the remaining cream and Parmesan cheese. Mix again. You can do this in parts, to cover the pasta in the cream sauce mix some and then put onto a serving platter, then repeat again for some more pasta and add the serving platter. Work quickly so as not to dry out sauce and pasta will quickly absorb sauce. Season with salt and pepper, garnish with chopped parsley. Sprinkle with nutmeg and serve hot. Enjoy! Fettuccine is a long, flat and thin type of pasta, resembling Tagliatelle but being somewhat wider. An even wider type of this egg-based noodle is called Fettucce whereas a thinner version is named fettuccelle. Fettuccine is a specialty from Rome but can be purchased worldwide today. 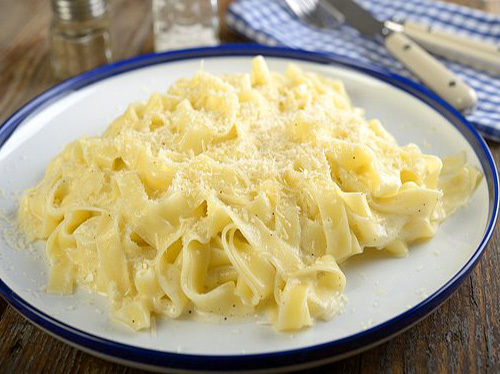 Our Alfredo sauce was first served with this type of noodles. Nevertheless, you can replace them with virtually any other kind of pasta. While there does not seem to be anything special about butter it is still useful to know that butter contains a considerable amount of natural emulsifiers. These will make sure that your Alfredo sauce has the right consistence and thus, butter should be preferred over other substitutes. For the same reason butter is an important ingredient in many sauces. Moreover, butter contributes with its good taste on its own to a well done Alfredo sauce. The best cream to be used for Alfredo sauce is heavy (whipping) cream; containing 35% of fat or a little bit more. Light cream is fine, too but is more endangered to fall separate when it comes to sauce making and being heated. Hence, for a light, low fat sauce Alfredo you will have to use additional stabilizers such as flour or starch. Egg yolk would be another natural emulsifier you could use if you want to add acid liquids such as lemon or lime juice to your Alfredo sauce. Parmesan is the French name for the Italian Parmigiano, a cheese based on cow milk stemming from the Parma region in Italy. Parmesan has to age between 12 and 72 months. Accordingly, it is extremely delicious, but not always the cheapest cheese. In Europe the label Parmesan is protected and may be used only by producers of the very region. In US everyday language Parmesan might be used for several kinds of “Italian” hard cheese. Often there are not as long aged as the original one and contain more salt. Nevertheless, they are still a good ingredient for our Alfredo sauce and you should not hesitate to use them. Grated Romano cheese or Asiago might do it likewise, yet they will alter the flavor of the sauce.